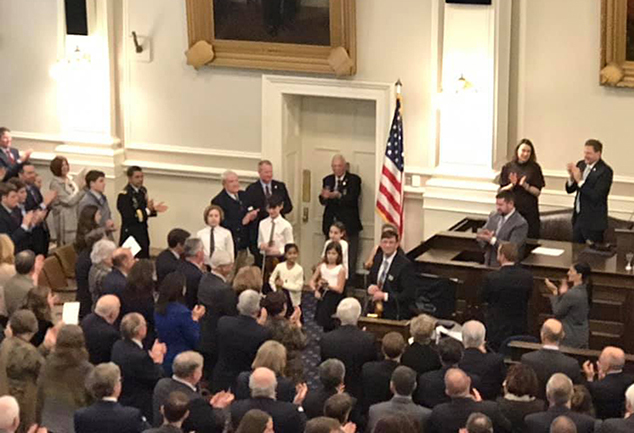 Twelve year old Andover resident Oliver Andrews was part of an ensemble from the Upper Valley Music Center that played at the 2019 inauguration of Governor Sununu. Andrews (holding violin and bow near center of photo) and fellow players receive applause from the governor and other attendee at the state house. Twelve year old Oliver Andrews, a seventh grade student at AE/MS, had the honor of being part of a string ensemble from the Upper Valley Music Center that played for New Hampshire Governor Chris Sununu at his inauguration in January. When only about three years old, Andrews heard a group of students perform at the Peterborough Children and the Arts Festival and became interested in playing the violin. He currently studies the violin at the Upper Valley Music Center (UVMC) in Lebanon, NH. Andrews travels to Lebanon once a week for three hours of instruction, where he is part of a group class and individual instruction with teacher Ben Vliet. Andrews also plays with the Vivace Orchestra, based at UVMC and led by Mark Nelson. The UVMC website describes this orchestra as “a fun and educational orchestra for strings, winds and brass.” The orchestra and Andrew’s group “Suzuki Class” offer performances from time to time. For the Governor’s Inauguration, students were chosen from various levels of the “Suzuki” program at UVMC. Though he prefers playing Classical Music, he occasionally does play traditional or folk “fiddle” music. His favorite composer is Dimitri Shostakovich. Friends at school have heard Andrews perform at school events, such as the Veteran’s Day ceremonies and other school assemblies. Andrews says that he enjoys playing for audiences. Although he often feels nervous before a performance, once he begins to play the nervousness goes away. 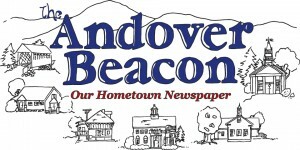 Andrews has lived in Andover since he was one year old. When he is not in school or playing the violin, he can found biking, cross country skiing or composing original music. Behind every budding musician are supportive parents. Oliver’s parents are ? ?